How It’s New York: It takes place in, and is about, New York. 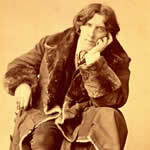 How It’s Irish: It’s about an Irish gentleman named Oscar Wilde. Oscar Wilde, the Irish poet, dramatist and wit, famous for his life in London and Paris, spent all of 1882 in America on an extended lecture tour across the continent. Nowhere did he spend more time than in New York City. Join guide and New York Irish Arts blogger John Cooper, founding member of the Oscar Wilde Society of America, for a leafy stroll through Madison Square Park, Gramercy Park, and Greenwich Village to trace Oscar Wilde’s debut in the social and literary world. Based on original research into Wilde and his circle in New York’s gilded age, see how Wilde was influenced by the aesthetic movement of the period, and how he in turn influenced the society of today. Learn about the life and times of this fascinating personality whose self-styled genius is as relevant today as it was when he arrived in 1882. To book visit their tours page.